Yesterday night, my wife and I decided at the last minute to see a second film of the day at 6PM. We were not really sure whether we want to do it at first, but then we thought why not? We were already at the same place where it showed 3 new movies anyway, and we still got time too. So off we see this one, which was categorized as disaster French movie. We shall dive into the movie now. Mathieu (Romain Duris - All The Money In The World) and Anna (Olga Kurylenko - Hitman, Quantum of Solace etc) were parents of a young girl named Sarah (Fantine Harduin) who suffered from an illness that required her to live in some kind of machine that would protect her from any outside air/germ which would be fatal for her. One day, an earth quake hit Paris which resulted to poisonous gas covering the whole city. Mathieu and Anna had to escape to the apartment owned by an elderly couple named Lucien (Michel Robin) and Colette (Anna Gaylor) while leaving Sarah behind, as she would be saved as long as she stayed in the machine. However, the mist from the gas did not deteriorate soon enough. While things became very complicated as the battery to power the machine could only last for certain time. With time running out, Mathieu and Anna had to find ways to save their only daughter. So could they be successful? Find them all in this disaster touching drama movie. Well this movie turned out to be pretty amazing. 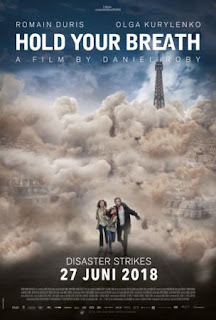 It was not having a unique or different formula from other disaster movies, but what it did was to put the emphasis on the survival of only few of the people. While other big budget disaster movies focused on the special effects that would blow our mind using expensive CGI effects, this one did no such thing. In fact the worthy mentioned special effects were used only when the gas blown and to show the mist surrounding Paris with few other smaller effects. And since the focus was only of the few people, as opposed to many many characters in the conventional disaster movies such as The Day After Tomorrow or 2012 and other similar ones, we could really root for the main characters. I loved the performance of the lead characters here. Romain Duris was great as the father who would do anything for his family while Olga Kurylenko was wonderful as the mother and wife. And the elderly couple were so nice they really made us dreamed of being just like them. This movie was like an emotional ride that could only be made possible by performances from these people. There were quite a number of emotional moments that really affected my wife and possibly other audience as well. I think credit must be given to the director Daniel Roby who was able to make sure they performed to his expectation and for making the pace of the movie just nice for around 1.5 hour movie. Trust me the movie did not feel boring at all, especially since the disaster started out quite early in the movie. One thing that surprised us was the ending. It was not something that I would have guessed (though my wife somehow had a feeling it might be like this). But the thing is, such ending might not give the closure that general audience would have liked. So we will see if people actually loved or hate the ending. But for my wife and I, we thought it was quite good. And I was personally satisfied seeing this movie in the original French language rather than lousily dubbed into English. No offense but sometimes dubbing if not done by good dubbers would have made a movie feel dull especially if it was done poorly with no emotion at all. And funnily enough, because it was a French movie, the title was translated to Hold Your Breath in Indonesian cinemas while in other media it was translated as Just a Breath Away. Anyway, I think that this disaster drama movie would be good for both the younger generation and the more adults as it was both a survival & the love of parents to their child story. But if you are looking for high special effects disaster movie and you prefer your films to be English spoken, then this one might not be to your liking. For me and my wife though, we quite enjoyed the movie and we believed it was a good one. We certainly felt lucky that we decided to see this at the last minute. While it is still playing in Indonesian cinemas, I think this one would be good to see before it probably no longer playing next week when another major Marvel movie (Ant-Man and the Wasp) premier.